Last year, I launched the Mayor’s Youth Speaker Series – an ongoing series of keynote discussions with prominent Canadians from a variety of sectors aimed at inspiring youth in Mississauga and providing them with guidance as they prepare to enter the workforce. The first event featured award-winning journalist Amanda Lang of Bloomberg News. I am proud to announce that our second event in the series will take place on November 22nd, 2017 from 7pm to 9pm. Our second speaker will be Professor Patrick Gunning, Canada Research Chair in Medical Chemistry Professor, Department of Chemical & Physical Sciences University of Toronto Mississauga. 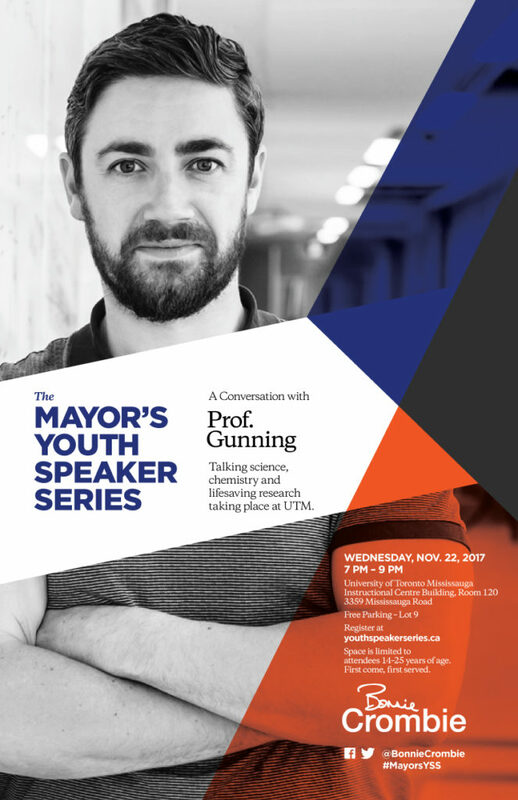 Professor Gunning came to UTM in 2007 following a post-doctoral fellowship at Yale University. In the ensuing ten years, he has had an enormous impact on cancer research, as well as research on campus. The recipient of numerous awards, Patrick Gunning was recognized as one of this year’s ‘Canada’s Top 40 Under 40’ by Cladwell Partners. I am committed to combatting the staggering youth unemployment rate in Mississauga through a variety of initiatives, including The Mayor’s Youth Speakers Series. This initiative is intended to engage, inspire and provide youth with the opportunity to hear from industry leaders on their struggles and success stories. Research has shown that a strong network and connection to mentors can open doors for youth as they transition into the workforce. This entry was posted in Carousel News, Mayor’s Youth Jobs Initiative, News, The Crombie Column. Bookmark the permalink.